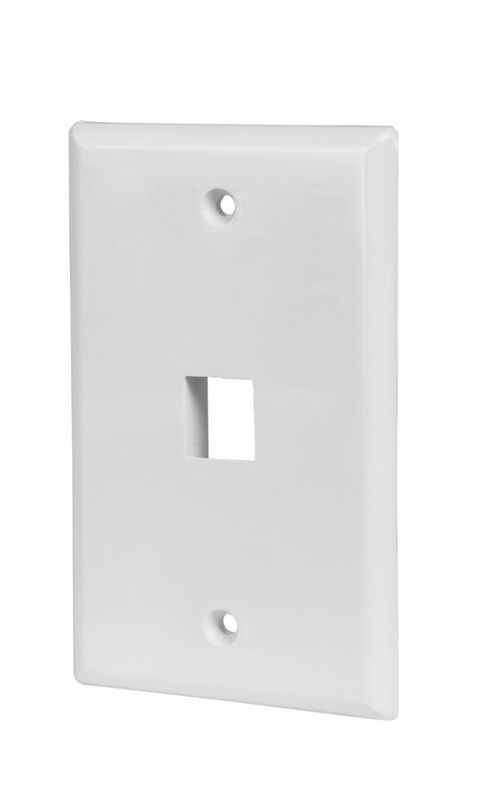 The CE Tech 1-Port Wall Plate is used to install low voltage keystone inserts to a desired location. The wall plate's low profile design mounts flush to the wall. CE Tech snap-in inserts easily snap into the port of the wall plate. Provides a keystone connection for high-speed internet, home theatre, cable and satellite TV, DVR, receiver, surround sound, HDMI, etc. Fill with 1 CE Tech snap-in insert (sold separately). Mounts flush to a standard 1-gang wall box or mounting bracket. Includes mounting screws for simple installation. Warranty covers passive components for a period of (10) years from the date of purchase. The CE-TECH White RJ-11/RJ-45 Phone and Network Wall Plate offers ports for connecting telephone wire and Ethernet cable. This wall plate screws onto a standard in-wall electrical box. Enjoy a HDMI connection with in-wall installation through the CE-TECH HDMI and Ethernet Wall Plate. This wall plate provides a high-quality HDMI signal and transfer Ethernet data. it fits standard wall plate outlets. Equipped with a modular plug at each end, the CE-TECH 25 ft. White Phone Line Cord is used to connect phones, modems, computers, fax machines and caller IDs. 1-Port Wall Plate in White The CE Tech 1-Port Wall Plate is used to install low voltage keystone inserts to a desired location. The wall plate's low profile design mounts flush to the wall. CE Tech snap-in inserts easily snap into the port of the wall plate.